The Sony Xperia Tablet S can now be purchased online, however if you want the 3G version you're going to have to wait. There are two Wi-Fi-only models available on the Sony site, the 16GB Xperia Tablet S for £329 and the 32GB variant which will set you back £379 - while the Wi-Fi + 3G, which comes with 16GB of stroage and is available for pre-order, flaunts a tag of £429. This is cheaper than the new iPad equivalents, which come in at £399, £429 and £499 respectively, although the Xperia Tablet S is a little dearer than the admittedly less attractive Samsung Galaxy Tab 2 10.1. The Sony Xperia Tablet S comes packing a 9.4-inch 1280 x 800 display, 1.3GHz quad-core Tegra 3 processor, 1GB of RAM, 8MP rear camera, 1.3MP front snapper, 6,000mAh battery and Android 4.0 Ice Cream Sandwich. If you still need some convincing the Xperia Tablet S has slimmed down by almost 10mm in some areas compared to the original Tablet S, the Japanese firm has made the slate splashproof and it is promising a Jelly Bean update in the nearer future. We're looking forward to getting the Xperia Tablet S in for a full review soon, but in the meantime you can find out what we thought of it in our hands on Sony Xperia Tablet S review. 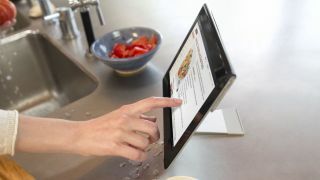 Take a look at our Sony Xperia Tablet S hands on first look video below to see what the tablet has in store.